The people of Honduras have been hit the hardest over the past few years because of growing corruption that has corroded state structures, allowed 96 percent of crime to go unpunished, and multiplied public debt exponentially. The cost of basic foodstuffs has increased, as have unemployment and the mass migration of our fellow citizens to the United States. Our people face 20 homicides per day, the devaluation of our currency, extortion, unbearable insecurity, growth in organized crime, and an authoritarian government that—in addition to violating the Constitution of Honduras to stay in power—wastes taxpayer money on publicity stunts, puts the military police to their personal use, and pursues a populist agenda. The list of abuses goes on and on. Honduran society has been pushed to the point of collapse—coopted state institutions, an ineffective justice system, a rickety democracy, and a practically useless Honduran healthcare system. But it doesn’t stop there. We were outraged by the looting of the Honduran Institute of Social Security (IHSS), where $7 billion lempiras (US$300 million) were systematically extracted by shell companies that later made “good-faith donations” to the Partido Nacional (National Party of Honduras) for its presidential campaign—a campaign so violent that it resulted in more than 3,000 deaths. Throughout the country, for the past 20 weeks we have carried out uninterrupted protests (Movilizaciones de las Antorchas), in which almost 300,000 people have participated in Tegucigalpa alone and more than two million nationally. Yet there has not been a single firm conviction despite proof of the looting of the IHSS and the entire healthcare system. The president flatly refuses to establish an independent body with the power to investigate, with its own prosecutor, and to strengthen the justice system as was done with Guatemala’s International Commission against Impunity (CICIG). He insists that all be under his personal control. 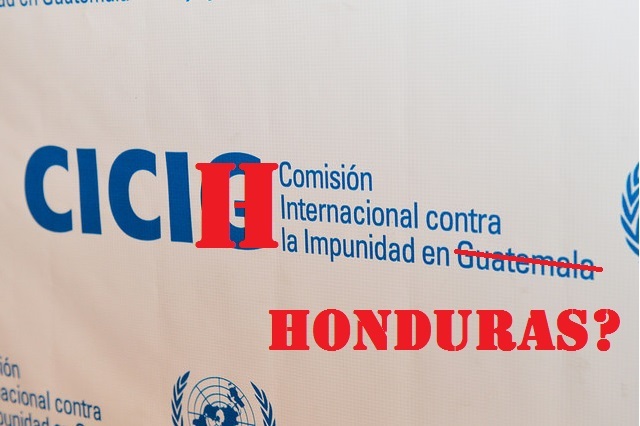 We, as the Movimiento Social Oposición Indignada (the Indignant Opposition), will continue to call the Honduran public to protest peacefully until a Honduran International Commission against Impunity (CICIH) is established and until crimes, such as the looting of the IHSS, are punished. I always appreciate when a foreigner talks about a country. I come from the country I lived in Honduras my entire life. The corruption has always been there and the coup was much needed or we would have another Venezuela in our hands. Unable to get rid of a money hungry politicians that only seek to fill their pockets. Yes, CICIH might not fix everything put at least is the beginning of something for the people regain faith on society.